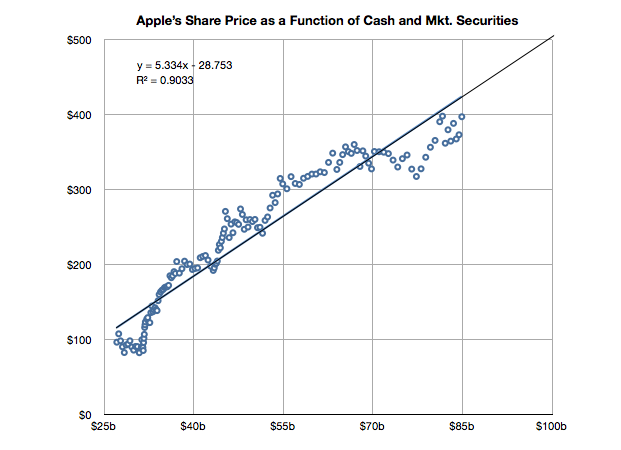 The slope of the line above has decreased slightly but a strong correlation can still be observed. 5by5 | The Critical Path #7: Genericized Trademarks. Generally speaking there is an equivalence drawn between iOS and Android as technologies and even as user experiences. However, as I’ve pointed out on several occasions there is a very clear nonequivalence in business models and thus the “fuel” which keeps each platform running. But does this difference in models lead to some difference in the way the products are “hired” to do what they do. Does it imply anything about how the products are likely to evolve? I collected into one place all the data I could find about utilization (how much of a service and how often it’s used) and possession (both in terms of current ownership and new acquisitions) of iOS and Android. 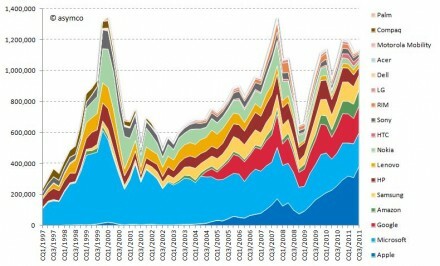 Possession data comes from comScore survey data of share of US installed base of smartphones by platform at the end of June 2011 (first chart) and share of Global Smartphone Purchases as of Q2 2011 sourced from company reports and IDC (second chart). 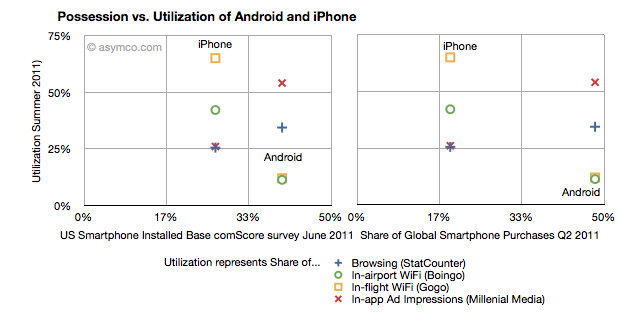 Utilization data (vertical axes) comes from August 2011 shares of mobile browsers (from StatCounter June 2011), in-airport WiFi associations from Boingo in June 2011 (iPhone vs. Android), in-flight Wifi associations from Gogo in June 2011, and In-app Ad impressions from Millenial Media also in June. The charts are divided into nine sections corresponding roughly to “low”, “medium” and “high” utilization vs. possession. The first chart compares a US-only population for possession vs. a mixture of global and US-only populations for utilization. The second chart compares a global population to the mix of US and global metrics. In the post on OS turning circles, I used the concept of a radius of turning as an analogy for agility. One problem with the analogy is that turning in circles implies a return to a starting point or at least a closing of the loop. The idea is that there is lifecycle repetition. However, in reality, this does not apply to the world of operating systems. An OS, as a platform, usually has a finite life. It is born, grows and usually reaches a point where it is no longer supported. Sometimes, a new platform is born to take its place from the original owner but more often a replacement comes from a new challenger company. 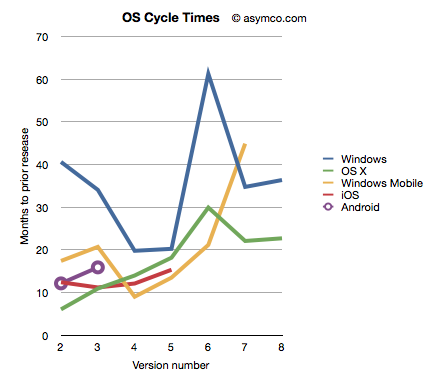 So rather than circles, the analogy of OS lifetimes may be more accurate. If we do think of platforms as finite, then the natural question is what causes an end? 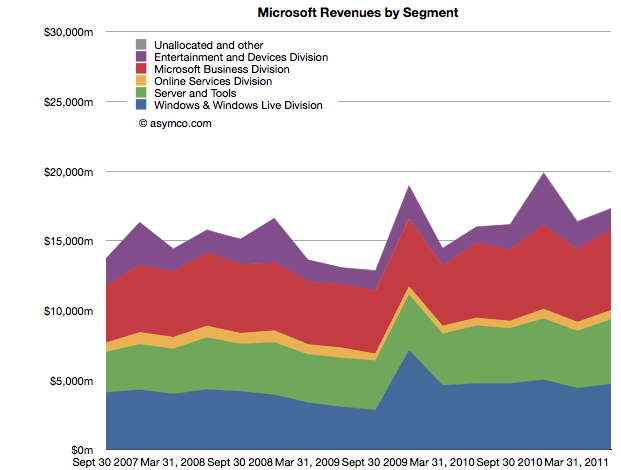 We need to look for patterns which may indicate when a platform is reaching end of life. The difference in this analysis is that the measure of “age” of a platform I use is not time per se but versioning. The logic is that each major version is a meaningful and significant improvement in a platform which needs to be delineated, marketed and celebrated. It embodies the business logic as well as the engineering logic of the platform custodian. Taking the data from the last post I added a few more platforms: Symbian, PalmOS and Blackberry OS to seek out patterns. 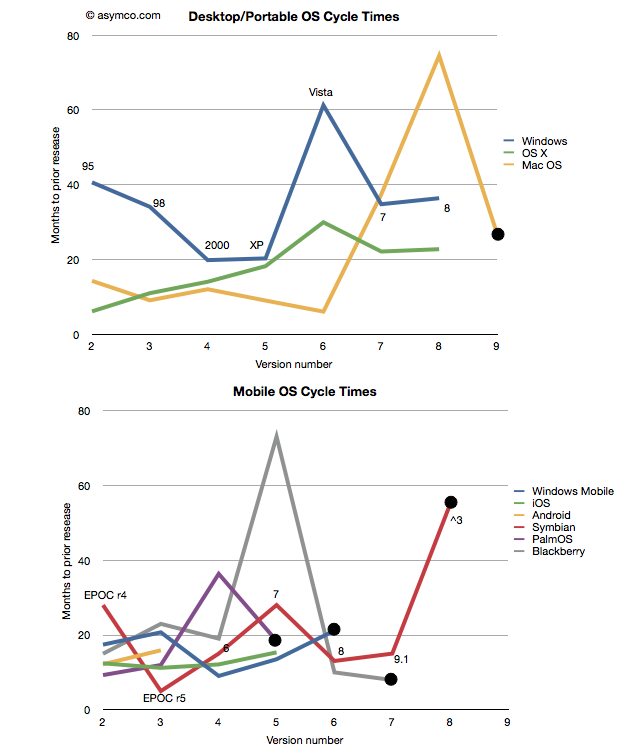 I also separated the desktop/portable OS’s from Mobile OS’s and plotted these version-demarcated lifespans. I’m glad Windows 8 is named the way it is. With Windows 7 Microsoft went to a numbering system which is much more rational than the mixed naming of the past. The number 8 actually corresponds to the actual sequential number of major versions of Windows released to date. Windows proper actually did not start with what was called “Windows 1.0”. Windows actually started in April 1992 when Windows 3.1 was released. It was the first Windows which was an operating environment onto itself, apart from DOS. It was followed by Windows 95 (which we can call “2”), Windows 98 (“3”), Windows 2000 (“4”), Windows XP (“5”), Windows Vista (“6”), Windows 7 and now Windows 8. Given this nomenclature and the dates of general availability of said versions, we can derive a measure of the frequency of upgrades. 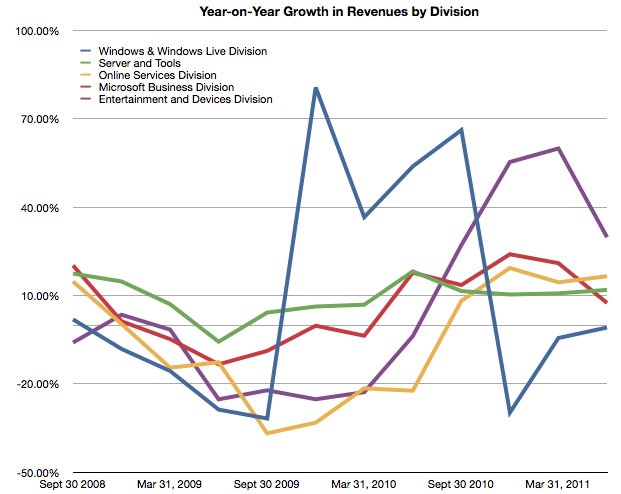 For example Windows “2” followed about 41 months after “1” and “3” took 34 months after “2”. If we continue this for all the versions, and assume “8” will launch by October next year, we can plot the cycle times of new Windows versions. 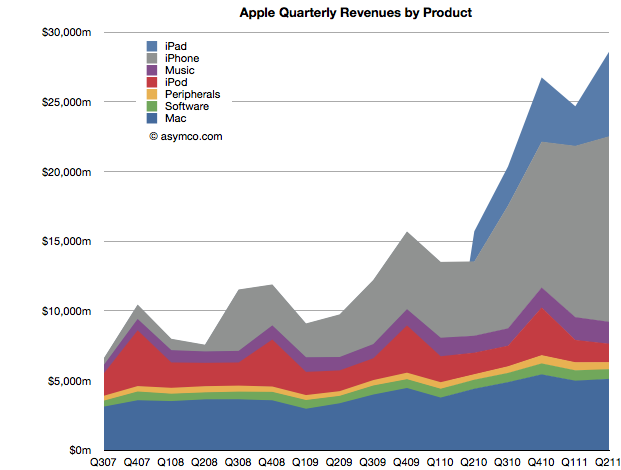 To make the story more interesting I added the same data for other OS platforms. OS X, iOS and Android have version numbers which correspond to the sequential order in which they were released. I am assuming that the numbering system (1.0, 2.0, 3.0 etc.) are meaningful and that major releases are given a new integer value.